In match fishing you can test yourself against the very best, using the same equipment as the stars. Not so in other sports. Try popping down to your local Mercedes dealer and asking if you can have an F1 car like the one Lewis Hamilton drives. Or see if you can get on the Etihad pitch just because you’re wearing new Adidas footy boots! 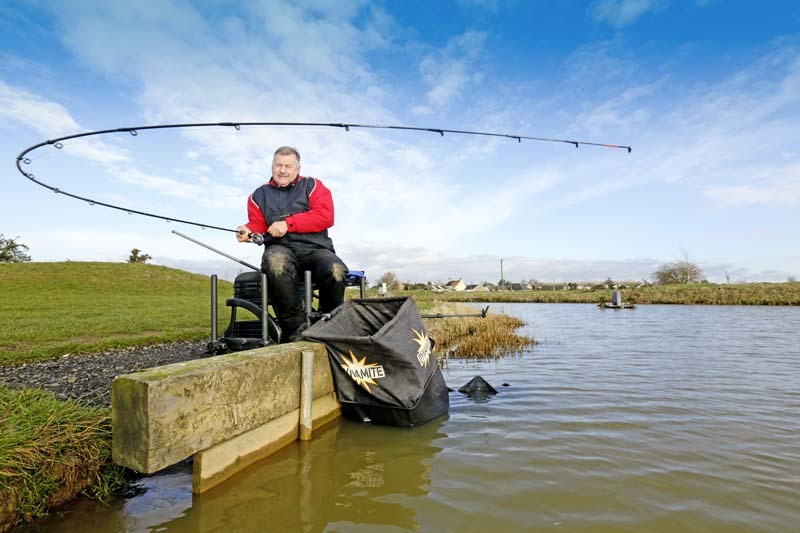 Spiky accusations of having ‘all the gear and no idea’ are often levelled at match anglers, but there’s lots to be said for using tackle chosen by world-class anglers. If it’s good enough for them, it’ll be good enough for you! So when Daiwa launched its Tournament Pro Feeder 10ft and Tournament Pro 9ft-10ft Feeder rods late last year I was itching to get my hands on at least one of the pair. But before revealing my thoughts on the new Tournament Pro Feeder 10ft that landed on my desk, allow me to dispel any false news that you may have heard about Daiwa’s latest Tournament Pro Match and Feeder rod range. The only changes are improvements to their spec – the handles are sexier than ever, with a new cutaway design and ‘Tournament’ embossed EVA foregrip. That, plus an improved matt black Tournament reel seat and new guides, is the sum total of the changes. Bias V-Joints, HVF Nanoplus materials and Megatop quivers remain exactly the same. Anyway, on a wickedly cold late January day came my chance to have a closer look at the new Tournament Pro Feeder 10ft. The weather, need I say, was brass monkeys, but Westwood Lakes near Boston are always good for a few bites. I chose Swallow, a narrow snake lake packed with F1s, carp and skimmers, and the ideal venue for a rod like this. Rob, manager of the on-site tackle and bait shop, advised me to fish peg 4, where you only need to cast a small maggot feeder two foot from the far bank to have them lining up – or so Rob said! Three hours later, as Angling Times staff photographer Lloyd sat in the car with the heater full on for fear of his long lens freezing and dropping off, the rod tip finally moved. A fractional twitch of the super-sensitive 0.75oz Megatop quiver was enough to strike at, and the first fish of the day came grudgingly to the net. The rod, like all Daiwa Tournament Pros, has a blank built in Scotland, delivering flex and action without compromising accuracy or casting power. The pain barrier is in the wallet. The full asking price of £415 works out at around £41.50 per foot… and well worth it. The blank’s outstanding forgiveness is a wonder to behold, yet it can shift up several more gears if necessary and pile on the pressure without recoiling, twisting or locking up. As a bonus, this year’s Tournament Feeder rods come with three (as opposed to two) virtually unbreakable Daiwa Megatop carbon quivertips. On the 10ft rod these are perfectly graded to suit the blank at 0.75oz, 1oz and 1.5oz. This world-class all-round feeder rod has no equals in its 10ft class. It’s better suited for use on small commercials and natural venues than to long chucks on open water, as it doesn’t have the length to pick up line fast enough, or cast to the horizon. But other than that, the only negative I can find is its price.